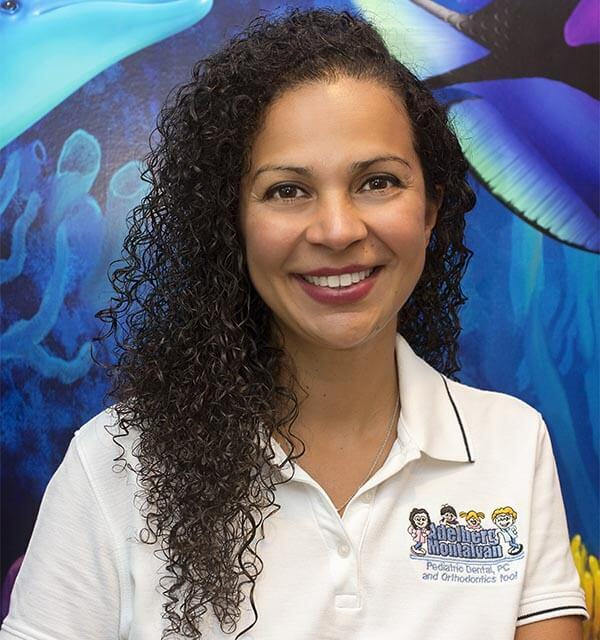 Dr. Ericka Montalvan, a pediatric dentist since 2005, has been practicing dentistry since 2000 after graduating from the University of Florida College of Dentistry. She received an undergraduate degree from the University of Miami, majoring in biochemistry and minoring in chemistry. After dental school, she continued a one-year general practice residency at a VA Medical Center in Florida. Two years after practicing general dentistry, her heart was set on pediatric dentistry, and she went to New Jersey to complete a two-year residency at UMDNJ Dental School. She is a board certified pediatric dentist. Dr. Ericka, mainly practicing in West Islip and Massapequa Park, also volunteers in the community and is involved in dental missionary trips around the world. She is an active member of many dental associations such as the American Dental Association, the American Academy of Pediatric Dentistry and the NYS Dental Association. She was raised in sunny Miami, Florida and now lives in New York with her husband, daughter and son. Dr. Ericka is fluent in Spanish and Sign Language. She strives to provide exceptional care for your children.